I’ll drop beats on July 26 at Therapy Nightclub with Mark Tester and Dozuki. Come check it out! This Saturday, July 21 I will drop a set at Indy CD & Vinyl’s “Vinyl Appreciation Day” at 7 pm. The whole inventory of vinyl will be on sale, so stop by, say hi and perhaps get your groove on in the vinyl section!? 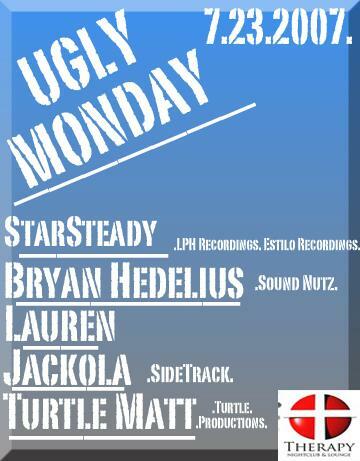 I’ll also be dropping beats at Ugly Monday, hosted at Therapy Nightclub on July 23, 2007. See the flyer below and note that there is no cover!